iTunes has been a popular place to buy TV shows ever since Apple made it possible and today they’re finally released what could be the best idea they’ve ever had. Apple is calling the new system a “season pass” and just like the name says, it makes it possible for users to purchase a full season of their favorite TV shows for a single price rather than by individual episodes. Of course for anyone that has already purchased certain episodes this might not be a great deal, fortunately Apple thought of that as well. Depending on how many episodes you’ve already purchased iTunes will automatically adjust the price to reflect the money you’ve already spent. 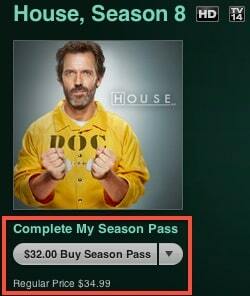 This is an absolutely brilliant idea that will definitely increase TV show sales through iTunes. The system is available now and will be expanding through more TV shows in the very near future.